Following The Thread: First Make of the Year: Purple Zsalya! First Make of the Year: Purple Zsalya! 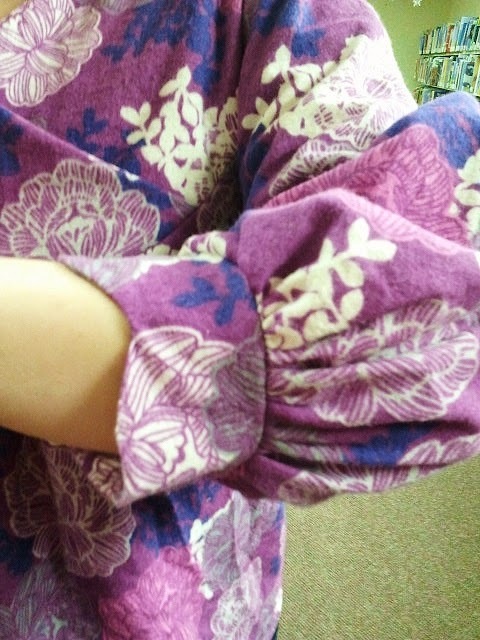 I found this beautiful floral flannel at the store just before Christmas, and knew exactly what I wanted to make with it. 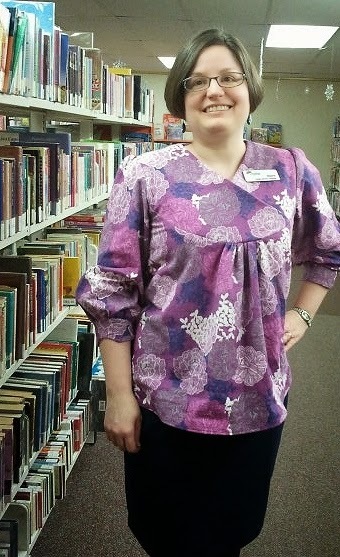 I immediately knew that the Zsalya tunic would be amazingly comfortable in this soft, warm fabric. 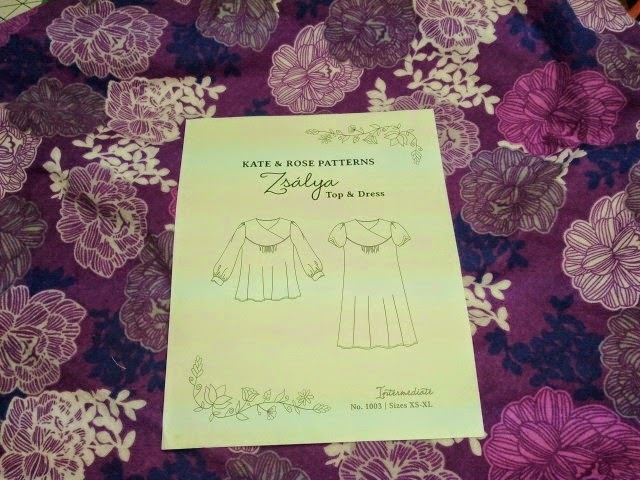 I first made the Zsalya pattern (by Kate and Rose) at the beginning of the summer; I bought it because of Indie Pattern Month in May. I love my little black dress, and knew that the tunic version was a must-make, too, especially in a cozy winter fabric. nice coworker snapping me at work! This is such a great pattern. 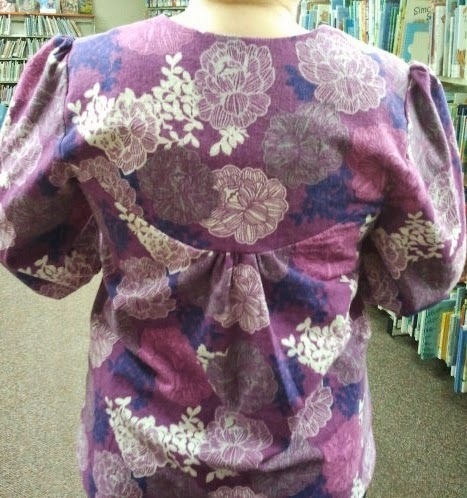 I really love all the little details -- the crossover yoke, the gathered sleeve with shaped cuff, the gathers at the yoke front and back. It is super comfy and yet still dressy and pretty, at least I think so. This winter version in flannel is cozy and the bright print made me feel spring-like even in -20C weather! The purpley-navy tones in the fabric also got me going on a mending job I've been meaning to get to for months -- a simple cinching of the waist on a navy knit skirt I picked up on super-sale at Target in November. I wore my new Zsalya with this skirt and my navy Rose Hip tights (from Seamster Patterns) to work today, for a great new functional outfit. Hurrah for finishing my first project of 2015! Very pretty fabric and a great new outfit to kick off 2015. Ooh- I love this shape! Nicely done! I love that it is fitted in the shoulder & chest area so that it doesn't seem sloppy even while it's loose over the rest of the torso. Suits me fine! What a cute pattern--it's so lady like. Well sewn! 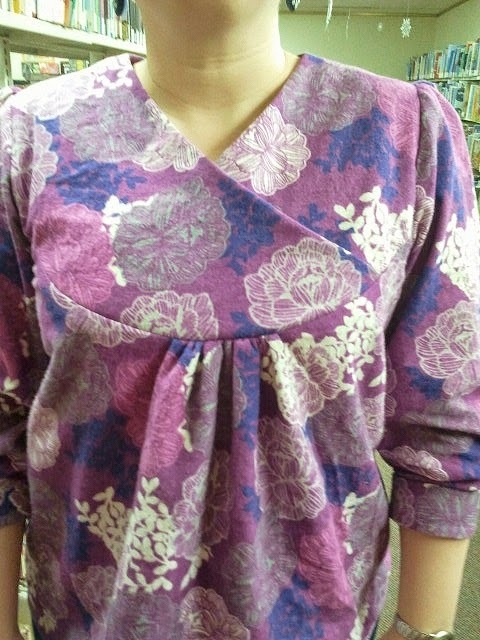 It's great -- no neckline gaping and very work appropriate. And so easy to wear! I got this pattern in the Pattern Parcel. I was a little skeptical with the yoke -- but yours!?! Swoon and sigh, it is gorgeous! Why thank you! The fabric is certainly one of my favourite things I've found lately. I do like this pattern a lot -- I hope that more people who got it via PP will try it out too!